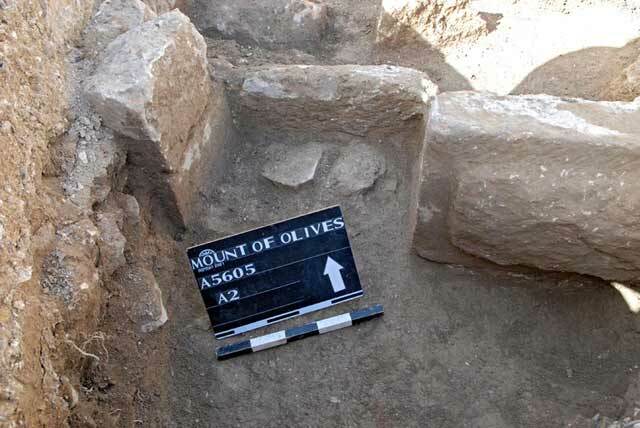 During February–March 2009, a trial excavation was conducted along the eastern slope of the Mount of Olives (Permit No. A-5605; map ref. 224465–88/632723–62), prior to the installation of a water pipeline. 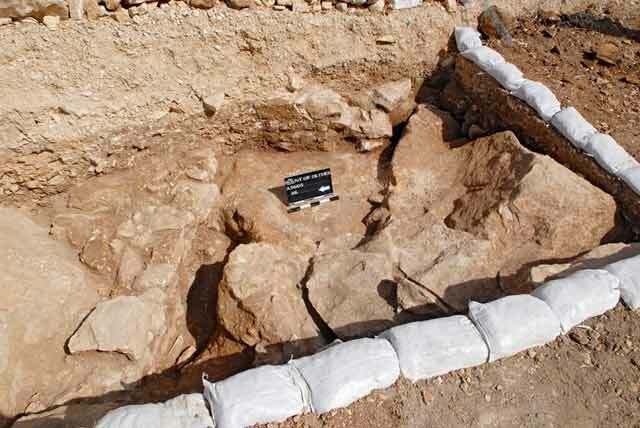 The excavation, undertaken on behalf of the Israel Antiquities Authority and underwritten by the Jerusalem municipality, was directed by I. Zilberbod, D. Amit and J. Seligman, with the assistance of Y. Ohayon (administration), M. Kunin (surveying and drafting), A. Peretz (field photography), E. Belashov (plans), C. Amit (studio photography) and D.T. Ariel (numismatics). The excavation (3.5×24.0 m; Fig. 1) was conducted to the southwest of the Monastery of Theodorus and Cyriacus. The monastery served as a hostel for pilgrims in the Byzantine and Early Islamic periods (HA-ESI 112:75*–78*). 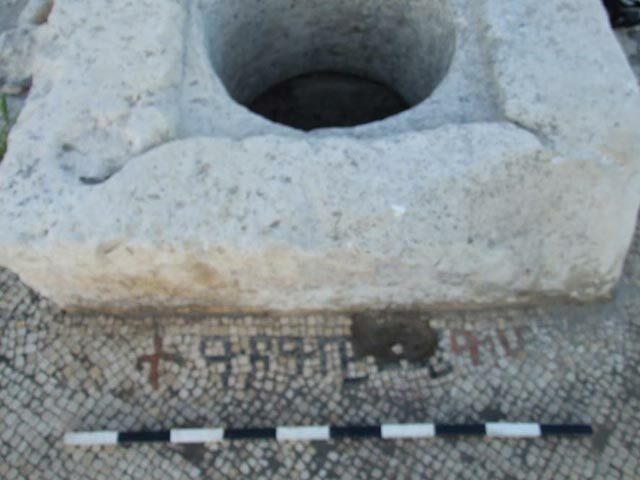 During a study tour of the monastery, led by S. Gibson in 2010, his assistant M. Groser noticed an Armenian inscription in a mosaic floor (below) located c. 50 m north of the excavation area. A short wall section (W3; length 3 m, width 0.9–1.2 m; Fig. 2), built of large ashlars, was exposed in the northern part of the excavation area. The wall was excavated only to a depth of 0.9 m, not reaching its foundation. Remains of pink plaster were revealed on the southern side of the wall. One of the stones in the wall was monumental (0.50×0.55×1.30 m); both of its outer surfaces had a drafted margin dressing and a prominent boss (c. 0.1 m). 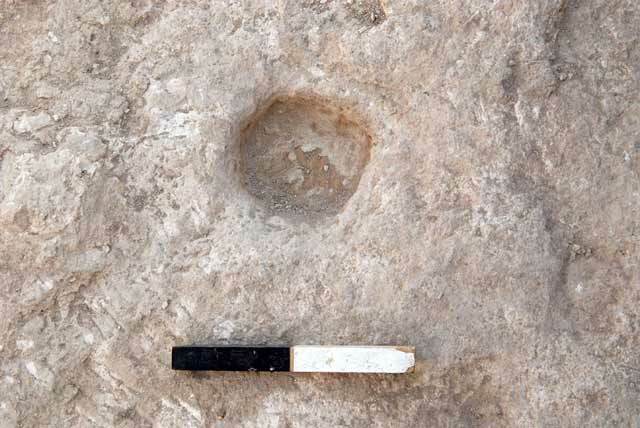 West of this stone was a threshold opening (L118; width 0.8 m, depth 0.65 m) that led to a room (L120), in which a white mosaic floor was aligned diagonally. At the southern end of the mosaic, near W3, was a mosaic frame composed of white tesserae arranged parallel to the wall. Apart from a small hewn depression in the bedrock (L115; diam. 0.12 m, depth 0.1 m; Fig. 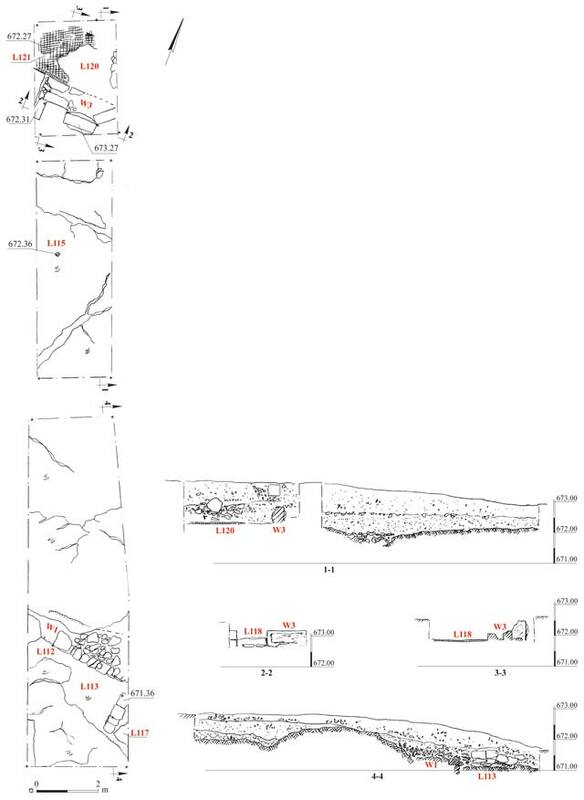 3) and natural channels that probably drained the rainwater, no architectural remains or rock-cuttings were exposed for a distance of c. 15 m south of W3. The foundations of two walls (W1—width 1.1–1.3 m; W2—width c. 0.5 m; Fig .4) that formed the corner of a room were exposed in the south of the excavation area. The walls were built of medium-sized limestone fieldstones in dry construction, set on the bedrock. A hewn drainage channel (L117; exposed length 1 m, width 0.2 m, depth 0.15 m) was exposed east of W2. The soil fill that covered the excavation yielded pottery and lamps dating to the Byzantine and Early Islamic periods (Fig. 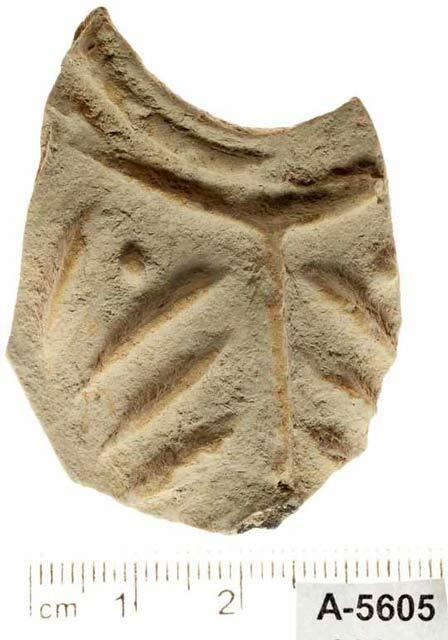 5), roof tiles and a marble fragment of a platter or table decorated with an ovolo motif (Fig. 6). In addition, three coins were discovered in the fill:a follis of Maurice from the mint of Constantinople (582/3 CE; IAA 104796), a coin from the Umayyad period, post-reform; Ramla mint (IAA 104794) and a fals dating to the Mamluk period, possibly of al-Mansur Qalawun (1279–1290 CE; IAA 104793). The Armenian inscription that was discovered by chance in the monastery was deciphered by M. Stone (M.E. Stone 2011. A New Armenian Inscription from a Byzantine Monastery Mount Scopus, Jerusalem. IEJ 61:230–235). It was revealed next to a cistern opening in a courtyard paved with a mosaic west of the church (Figs. 7, 8). The inscription was written in black and red tesserae. On the left side it has a cross of red tesserae and following it the name Grigor E.is written. Apparently the man’s name was followed by his religious title but that section of the inscription was damaged.The inscription ends with the two letters written in red, “K S”, which are an abbreviation of Christos. Meager architectural remains were exposed in the excavation. Based on the alignment of the walls they can be attributed to the southern part of the western wing of the monastery. The Armenian inscription is important evidence of Armenian religious activity in Jerusalem in the Byzantine period. To date, less than ten Armenian inscriptions are known from the Byzantine period in Jerusalem and each inscription constitute another tier in the study of this ancient community in the Holy Land. 2. Wall 3 and the threshold, looking north. 3. A rock-hewn depression, looking southeast. 4. Walls 1, 2, looking east. 5. A lamp from the Early Islamic period. 6. 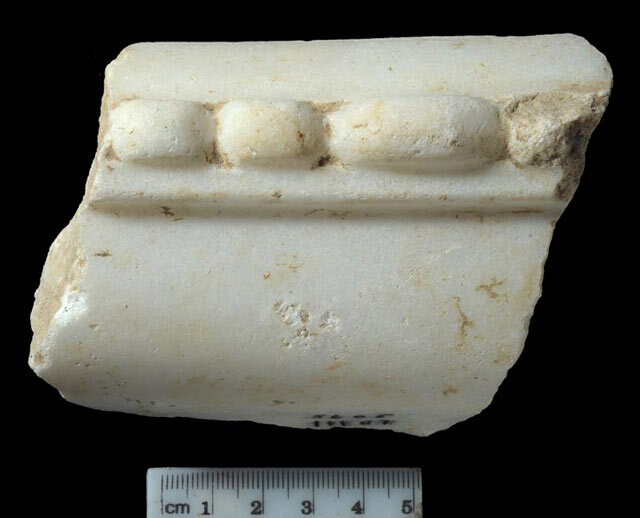 A marble fragment of a platter or table. 7. Inscription near a cistern opening, looking east.